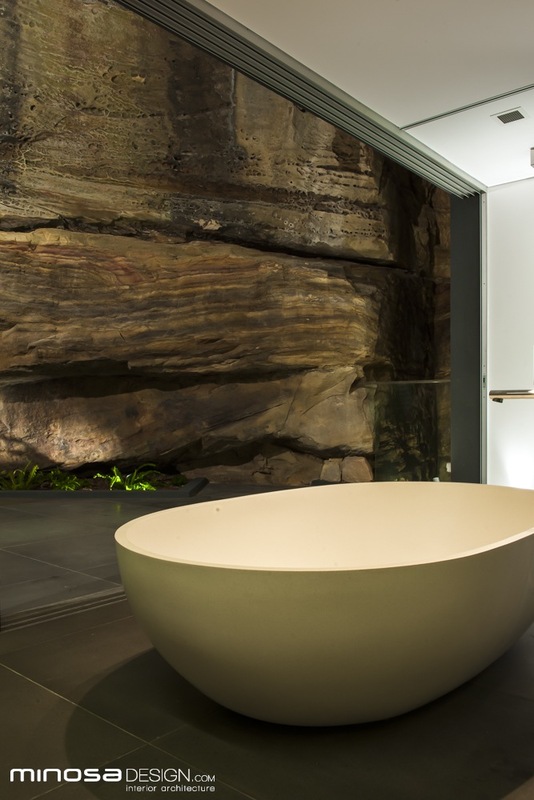 This home is perched and cantilevering off a hill in the prestigious suburb of Dover Heights in Sydney’s East. A beautifully architect designed home, boasting 270° panoramic views from Bondi Beach to North Sydney. 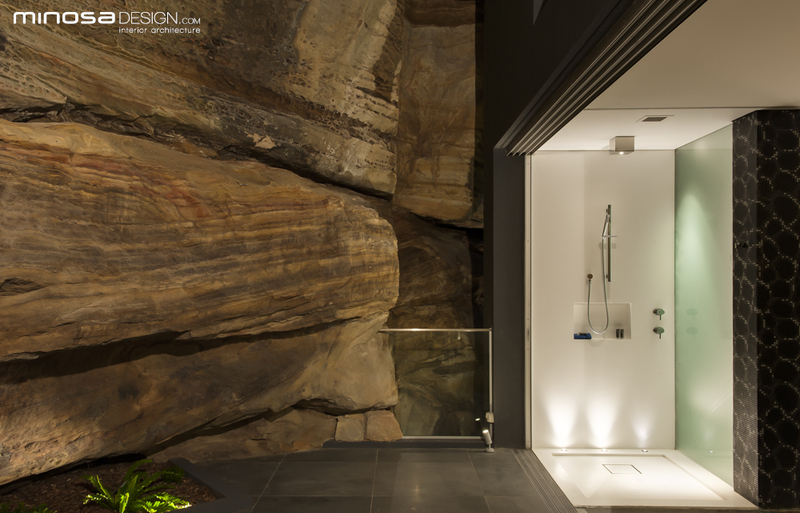 It sits on the cliff face with 2 levels above ground and four levels down and it’s a showstopper! It embraces its surroundings and captures the stunning views in their entirety. A cutting edge modern home both architecturally and with finishes such as enormous expanses of glass, concrete, sandstone and basalt. The family consisted of two self-employed adults with two young busy girls heading into their teenage years. The home had to cater to international guests and long close family visits. With all the busyness that goes on in their lives, the parents’ ensuite was to be a space to enable them to re-cooperate from the daily grind. A place for relaxation and rejuvenation! 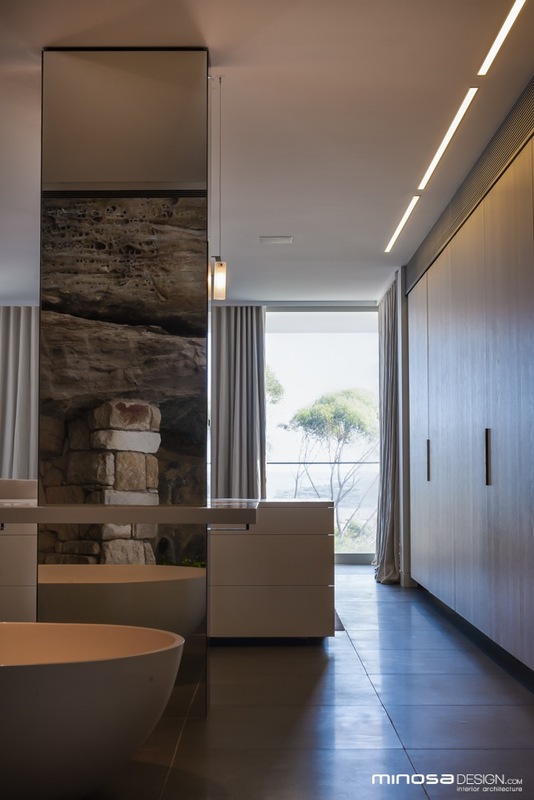 To create a resort style ensuite retreat, that incorporated the natural beauty of the cliff face behind and had views to the beautiful Bondi ahead. It was to be cutting edge in its design, it had to defy convention, be private and fit in with the sharp architectural style. In a few words… SHOW STOPPER! · BIG Wardrobe – NO exceptions! · An incredible piece of natural beauty!!! · The masculine hard edge nature of the architecture. 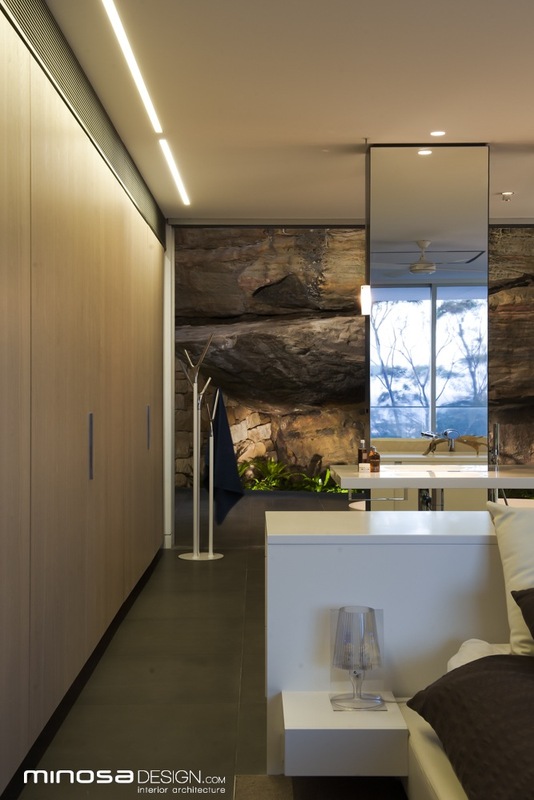 When the designer initially looked at this site, it was clearly evident that the existing cliff had to play a pivotal role in the design of the space. This was inspiring, however difficult at the same time. It dominated every design thought and walls were removed so the cliff would be visible from every view. It was decided from this special design process that the entire space needed to be thought about as one whole floor, rather than one room. With no dividing internal walls to obstruct views it was the only way the special design could be resolved without difficulty or any further exceptions. The designer then set about the layout. The utilities within the space i.e. toilet, bidet along with the shower were tucked away behind two structural support piers on the only wall available to the ensuite. Both of these services are concealed behind opaque glass. 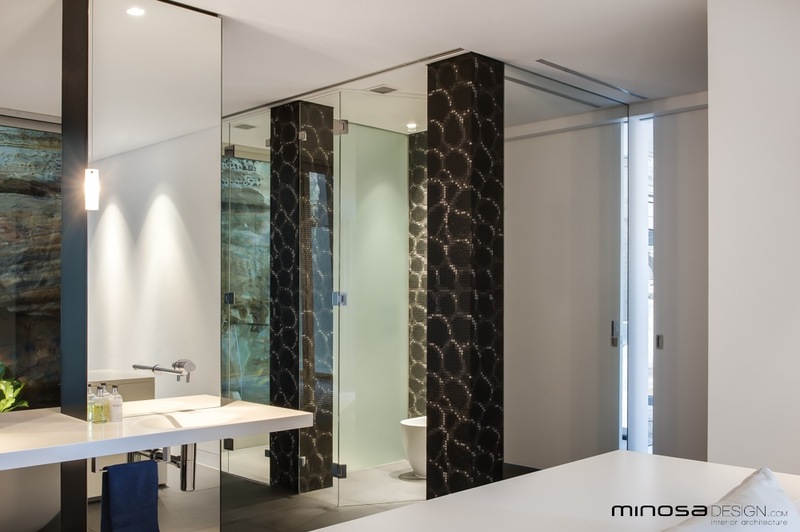 One large glass sliding door runs from either side to give privacy to the function, if required. Both the WC and shower cubicles have their own ventilation/extraction systems to handle what’s required. Having these areas to the side of the space also take them out of the line of site when entering the “zone”. 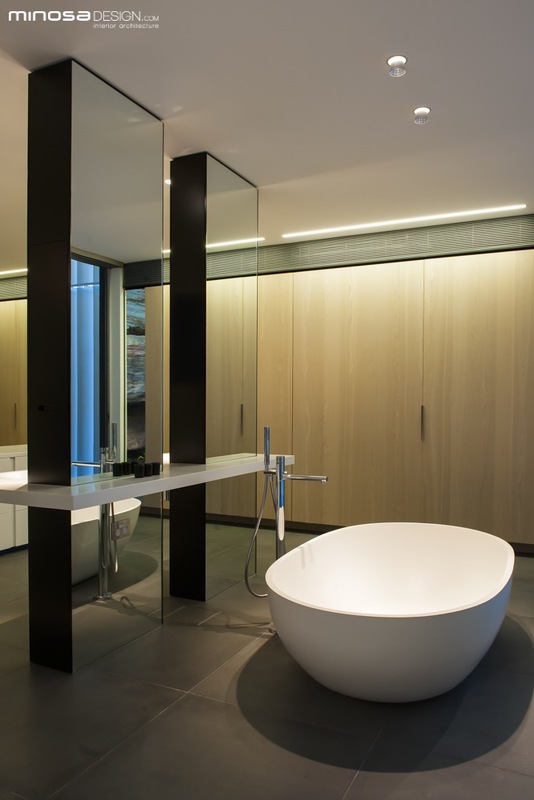 So with these services tucked away out of site the designer had to then consider the walk in robe, king size bed, double vanity and a large freestanding bath!! The robe was placed on the opposite wall to the utilities within the space. This gave the area 7.2metre storage for clothing cleverly concealed behind large 1.2 m wide “pop and slide” doors, perfect options to not encroach into the space as hinged doors would. Centrally within this robe is a personal vanity area with Hollywood styled make up lights, and designated space for all of the hair equipment, make up and jewellery. The client was absolutely delighted! All other fixtures were then centralised within the space. The designer chose to create what appears like two structural floor to ceiling walls. These walls are constructed from solid block work up to 1200mm to assist in fitting off the plumbing and support brackets, with the “top” section being lightweight pullout storage that was accessible from both outer sides of the walls. 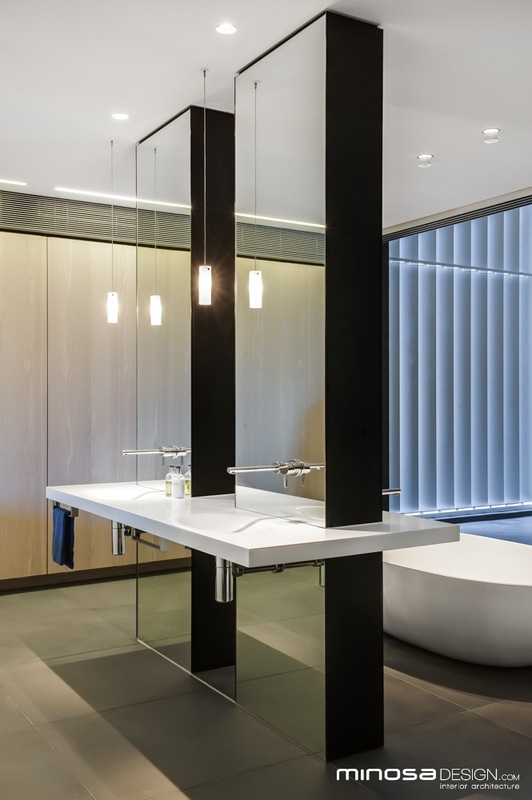 The custom Corian washbasin was then designed to wrap around the wall giving the impression of it dissecting these blade walls. Each wall was then completely clad in mirror to refract the view from wherever one stood. These two central walls define the bathing space from the sleeping and dressing areas. Behind these walls, closer to the rock face the bath was situated. Its large round organic form sits in complete contrast to the rough rock edge. To further connect the client to the cliff face, bifold doors were designed to fold away so during the warmer months of the year these doors could be open to create amazing cross flow ventilation but to also connect with nature whilst relaxing in the bath with a glass of champagne and a good book or taking a cleansing shower – ones own private wellness! The king bed was positioned at opposite end to this and a custom designed bedhead was also made which housed additional storage by way of drawers for towels face washers etc. It created a clear partition from sleeping and bathing without obstructing the views. The finishes were in keeping with the remainder of the home. The flooring was large format basalt tiles which ran throughout the home, walls if not tiled in a fun Bisazza crocodile print were clad in Corian®, the custom double wrapped washbasin also in Corian®; the veneer was light and the colour reminiscent of Bondis’ sandy beaches. Even the interior of all joinery pieces was coloured, something not often found in new builds today. All of the fixtures are of the highest quality with many pieces from Europe. 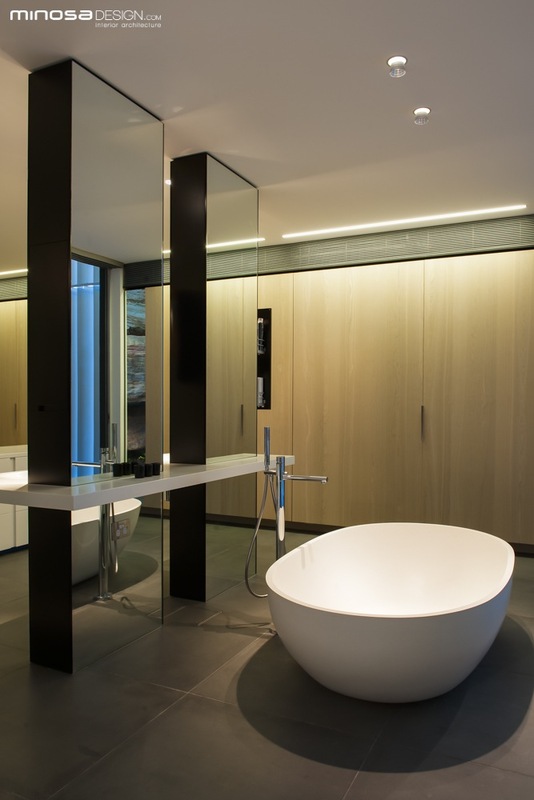 The lighting is crucial to the success of this space; all task lighting can be separately switched and adjusted thru the smart home automation system. The primary light source a 7.2m long LED diffused light running the full length of the wardrobe. 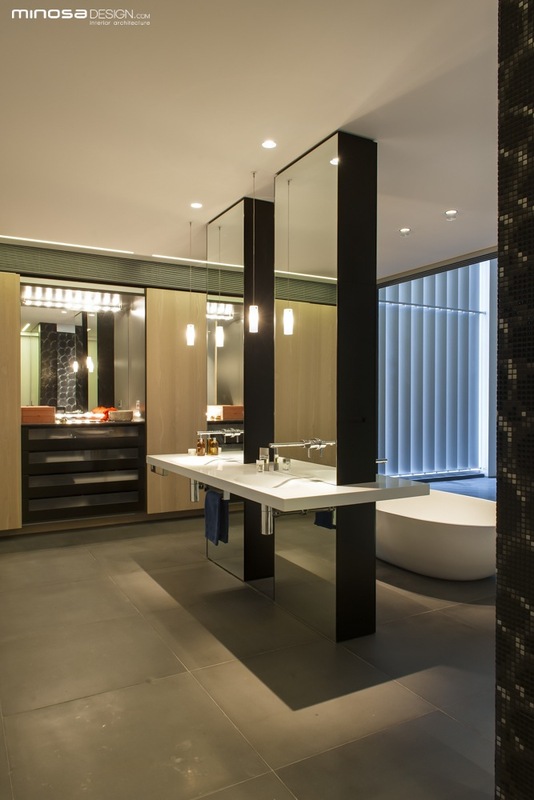 The lighting also highlights the beautiful finishes selected to compliment the architectural features. 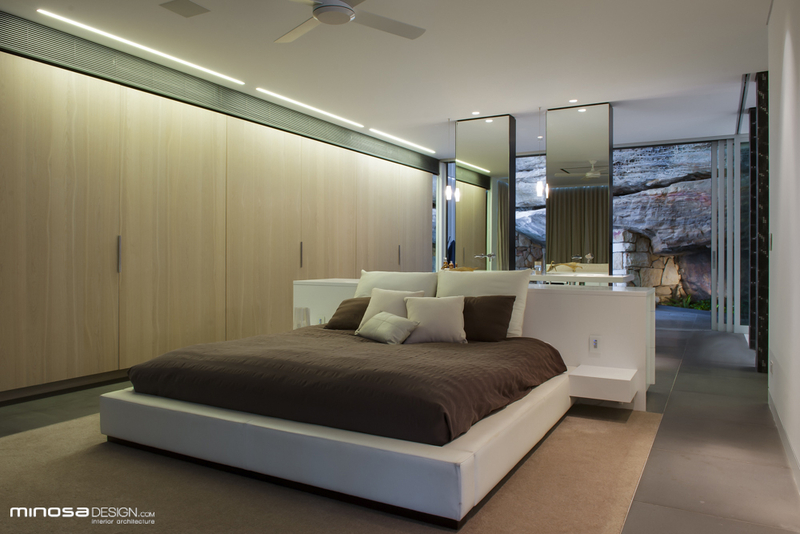 The success of this open plan space is the way it integrates the elements and plays with the stunning vistas on offer; the way it seamlessly allows one to move from dressing, to bathing to sleeping with out any disturbance to flow or function. It allows the users to unwind and relax from their busy lifestyles with ease and with complete harmony to nature that surrounds.